MADISON, WI (May 9, 2018) - It’s hard to pull off a national-title repeat if you don’t get to the tournament, which is a reality that Arizona State faced throughout the final round of NCAA Regionals. The Sun Devils had little room to spare Wednesday at University Ridge Golf Course in Madison, Wis., but in the end found themselves on the right side of the cut line. They’re headed back to the national championship in two weeks. For the Sun Devils, this week wasn’t fancy, it was just workman-like. They were around par all three rounds, and with four players in the top 25, advanced in the No. 4 position. Arizona State tied Ohio State at 1 under for 54 holes. It took an even-par team score to advance to the next stage of postseason. Illinois, seeded No. 5, was the first team out at 2 over. In Madison, it was a leaderboard all about experience. Duke took the top spot for its 10th NCAA Regional title. The Blue Devils were 14 under for the week. Their star senior, Leona Maguire, was 8 under on her own, which put her in a tie for second individually. Virginia was nine shots off that pace, but comfortably cruised into their 10th national-championship appearance in the program’s 15-year history. The team missed advancing last season, so Wednesday felt like a bit of redemption, and also was particularly gratifying given that the tournament was bumped up to an early shot-gun start in an attempt to avoid inclement weather. “The conditions this morning were really tough," Virginia head coach Kim Lewellen said. "Coming down the stretch, when they knew they might be on the bubble, they finished with a lot of birdies and showed what type of players and competitors they are. That showed the grit they have." After Virginia, the advancing teams were shockingly similar to last year’s NCAA match-play bracket. USC took solo third at 2 under, and after Arizona State and Ohio State in fourth, Northwestern slid inside the cut line with an even-par total. That’s half of last year’s eight-team match-play bracket, including winner Arizona State, of course, and runner-up Northwestern. In the end, Madison produced few surprises. Oregon State’s run as the No. 14 seed came to an end when they fell four shots short of the cut, but the Beavers will send sophomore Nicole Schroeder to the tournament as an individual. Schroeder fought to keep it together on Wednesday, backing up a double bogey on her sixth hole with a birdie on the next. Her even-par 72 in Round 3 left her at 10 under, good enough for the individual title. This now makes two years in a row that Oregon State has come within four shots of advancing. Wisconsin, which hosted the event, will also send its star senior Gabby Curtis as an individual after Curtis tied for fourth. The Badgers were also looking to advance from the No. 9 seed, but couldn’t get it done at home. Illinois’ Grace Park was the third and final advancing individual at T-11. On regional moving day, the top teams seem to have a way of finding the top of the leaderboard. At University Ridge Golf Course in Madison, Wis., No. 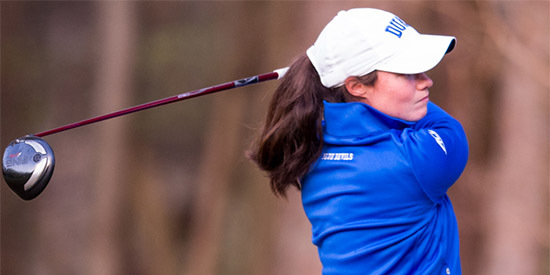 1-seeded Duke did that on the back of senior Leona Maguire. The two-time Annika Award winner and top-ranked player in the Golfweek/Amateurgolf.com rankings, posted 7-under 65 to pull her team up the leaderboard. It’s not like Duke had a long way to go, however. The Blue Devils trailed only Virginia, a fellow ACC school, after the first round. But as Duke posted 9-under 279 in Round 2, Virginia struggled to a 3-over 291. The Blue Devils now have a comfortable eight-shot lead. Behind the ACC charge lies the Pac-12. A young USC team is 11 shots off the lead, which makes winning a 12th regional title improbable but not impossible. Consider that the Trojans have already won five times this year. Behind that, defending national champion Arizona State is tied for fourth with Oregon State. As the true darkhorse in this regional, the Beavers are trying to prove that they’re not a flash in the pan. They entered this tournament as a No. 14 seed, but are clinging tightly to the top portion of the leaderboard. Oregon State topped its opening score by four shots in Round 2, and currently stands at 2-under 574 for 36 holes. In relation to par, Oregon State’s second-round score of 4 under is its second-lowest of the season. The Beavers posted 8-under 280 to open the spring at the Westbrook Invitational. In addition to the team, sophomore Nicole Schroeder also improved in Round 2. Schroeder fired 6-under 66 to lead the Beavers on Tuesday. Her round tied the program record for low 18-hole score that teammate Olivia Benzin set earlier this season. Schroeder started the day with a bogey on the first hole, but recovered immediately by going eagle-birdie on the next two holes. "It's fun to see Nicole take control of her game and grow as a player," Oregon State head coach Dawn Shockley said. "I'm looking forward to seeing them compete and battle one more day." Oregon State has advanced to the national championship only one time before, in 1998. Interestingly, it was from a regional in Madison, Wis. Behind the Pac-12 trio on this leaderboard is a Big 10 trio. Illinois, Northwestern and Ohio State are all tied for sixth at 1 over. Tournament host Wisconsin, another Big 10 school, dropped from sixth to 10th in the second round, but is only six shots out of that top-6 position. Wisconsin’s timing in hosting an NCAA Regional this week seems excellent. The Badgers are trying to qualify for the NCAA Championship for just the third time in program history, and for the first time since 2013. There are four seniors leading that charge and after one round, they’ve put themselves in the hunt for one of six advancing spots. 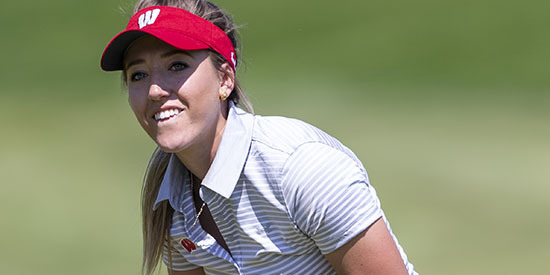 Gabby Curtis, one of those four seniors, did more than her share Monday at University Ridge Golf Course in Madison, Wis. Curtis birdied six of her final 10 holes on the way to a 5-under 67, the lowest round of her career. It left her tied for the individual lead with Virginia’s Beth Lillie, and perhaps more importantly it helped her team secure the No. 6 spot on the leaderboard, 11 shots off the lead. Wisconsin outscored the three other Big 10 teams in the Madison field on Monday, including last year’s NCAA runner-up Northwestern. Virginia is the top team after a windy day at University Ridge. An opening round of 8-under 270 left the Cavaliers four shots ahead of top-seeded Duke. Besides freshman Lillie, juniors Katharine Patrick (69, T-5) and Anna Redding (70, T-7) are also in the top 10 individually. The Cavaliers’ regional track record is strong. In its 15-year history, Virginia has been to NCAA Regionals 13 times and advanced to the NCAA Championship nine times. Perhaps one of the most brag-worthy aspects of Virginia’s first round was that it found itself ahead of ACC opponent Duke. The Blue Devils won the league championship last month for the 21st time in program history. USC, the No. 2 seed, finished the day at 3-under 285 and defending national champion Arizona State was another three shots behind that at even par. Perhaps the most surprising performance of the first round belonged to Oregon State. Despite a No. 14 seed, the Beavers are in fifth place after an opening 1-over 289. This spring marks the first time since the 2000-01 season that Oregon State has made back-to-back NCAA Regional appearances. The team finished a heartbreaking seventh last year at the Lubbock, Texas, site to barely miss a national-championship berth. 54 hole women's NCAA Regional from which the low teams advance to the NCAA Championship.